I’ve often heard not all infrared saunas are created equal, so choosing only the best infrared sauna is a must. But with so many choices in the market buying the perfect infrared sauna is not a walk in the park. So to save you from a ton of headache, we have reviewed the things you should look for an infrared sauna and listed 3 top brands as to why their infrared sauna is a must-have in your home. In choosing your very own infrared sauna, you will want a unit that can be assembled by 2 people and would not take much of your time. Remember you bought your sauna to relax and not to bring further stress to your life! Next on the list is versatility. The best infrared sauna unit is something that will easily fit in the current space you have or would only require minimal adjustments. Having the capacity to be fitted to any kind of flooring is definitely a plus. This perhaps is the most important feature to look for. An infrared sauna with low EMF carbon and carbon-tech heating elements is a must in your checklist. This technology provides even heating and efficiency. Golden Designs Saunaoffers different infrared sauna units for people with discriminating tastes. Their products showcase practical designs without compromising class and elegance. It easy to assemblewith its clasp together mechanism. In fact, Golden Design's Dynamic sauna claims it only takes 2 people and less than an hour to assemble their infrared sauna. When it comes to versatilityGolden Designs Dynamic sauna is a runaway winner. Each unit can be installed on any leveled surface like carpet, tile, laminate or hardwood floor. In terms of heating elements, this brand will not disappoint. It is installed with carbon-tech heating panels for even heating and uses low EMF carbon for maximum health benefits. What I love the most about Golden Designs Dynamic infrared sauna? They have different infrared sauna collections that will surely fit into your budget. Their price rangesfrom $1,500 to $2800. Check out their whole collection here. Now, next on our list is a player that has been industry since 1970. Baltic Leisure offers unparalleled performance when it comes to bringing healing and relaxation to your home. 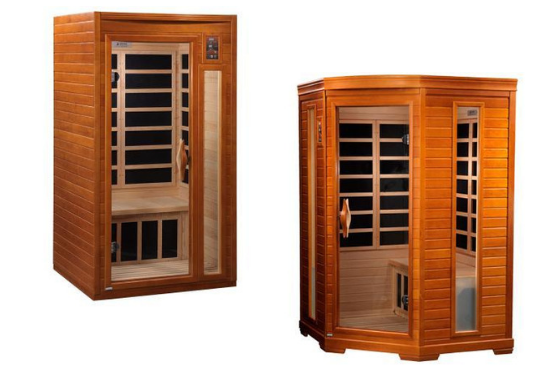 Each of their infrared saunas is meticulously created with soft lighting, clear select cedar, and quality craftsmanship. 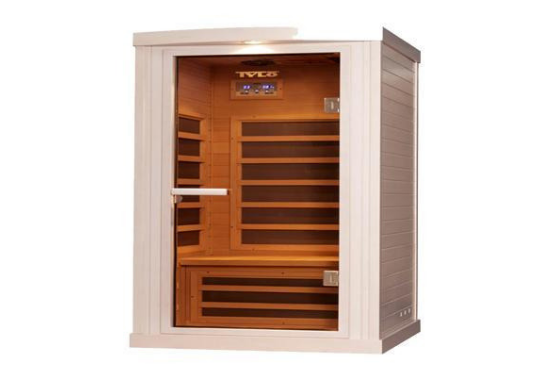 The Tylo infrared sauna by Baltic Leisure has an area of less than 16.1 sq. ft, with front access. Given its size, it has the flexibility to fit into small spaces and most ideal for modern bathrooms. When it comes to performance, Baltic Leisure's infrared sauna exceeds expectations. It is equipped with the modern control panel and regarded as one of the most energy efficient infrared sauna brands in the market today. Because of the modern technology used in this infrared sauna, Baltic Leisure's Tylo brand is considered to have one of the fastest heating time. What makes this infrared sauna brand superior to others? You get your money's true value. Baltic Leisure's Tylo infrared sauna is installed with CarbonFlexTM heating panelsthus enabling even heat distribution. With this technology, you are assured that all of your sauna's space is heated and there are no "cold spots". If this one has piqued your interested, then the rest will surely amaze you. Visit our Baltic Leisure collectionhere. The next product with are going to review maybe last on our list but they are definitely not the least. Saunacore’s infrared sauna is a testament to a long-standing tradition of delivering quality sauna products. Having perfected the traditional saunas, Saunacore now offers a wide array of infrared saunas with the most up to date features and technology. Among Saunacore's infrared sauna, the Infrared Infracore Premium Sauna Dual is probably the best. Why? Because with this model you can enjoy the best of both worlds. 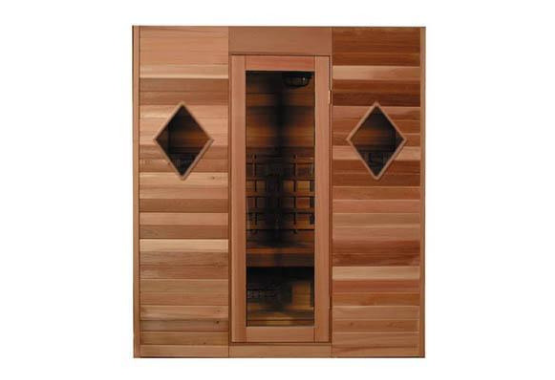 This sauna can function as a traditional sauna or an infrared sauna as well. When it comes to installation, Saunacore's Infracore Dual infrared sauna is a perfect choice. It does not require any plumbing. It has an open floor base concept and can sit on a pre-existing tile or concrete floor. Now when it comes to performance, Saunacore has the best technology in ceramic radiant heating emitters. With 16 emitters it only takes ten minutes to warm up. The Infracore Dual Infrared sauna is one of the most energy efficient infrared saunas in the market. Not only that, this unit is surrounded with concave shaped pure wide ceramic heating emitters so infrared is thoroughly absorbed by the body. The most amazing feature of Saunacore's Infracore Dual Infrared sauna? Its soft-touch electronic digital keypad which allows easy controlof time/ temperature settings, Rapid Even Air System, and standby procedure. The keypad also comes with an LED display so reading in the dark is no longer a concern. Saunacore maybe on the higher end when it comes to price range but its performance is truly priceless, and the good news? We got their whole collection here!